Firearms can be safe whether used for recreation, competition, or professional training, so long as all of the rules are followed. However, an untrained or uncaring individual can put the lives of others at risk when misusing firearms. Ensuring safety at the range is paramount so many ranges employ one or more NRA Certified Range Safety Officers to catch safety violations before they turn into ambulance rides. This course will help you develop the knowledge, skills, and attitude to become one of those officers. 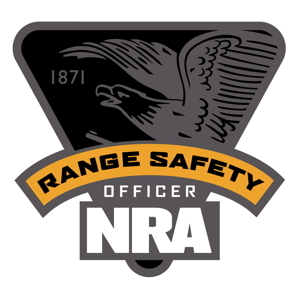 You have to be 21 years of age or older in order to become certified as an NRA Certified Range Safety Officer Trainer. You also need to know the basics of firearm safety and have a measure of knowledge and proficiency in operating different kinds of firearm actions (from revolvers to semi-automatic rifles). There are some firearms handling exercises during the course to ensure you have a suitable background in firearms. This is a classroom course with no live-fire exercises. However, the classroom instruction will include exercising the skills learned, including loading, unloading, and handling firearms for other students role-playing as visitors to a range, working through an emergency exercise, and discussing nomenclature of various firearms and action types. Your ability to perform these exercises will be assessed. At the end of the course is a written examination covering what you learned. A grade of 90% is required to pass. You will receive an NRA Range Safety Officer Student Study Guide, a Basic Firearm Training Program Brochure, an NRA Gun Safety Rules Brochure, and a signed certificate showing you passed the course. Becoming an NRA Certified Range Safety Officer is an excellent first step toward a career in firearms. As an NRA Certified Range Safety Officer, you qualify for a position at ranges across the nation. You will also be safer when you visit a shooting range and will be able to educate newcomers to the sport with greater aptitude. There is also the potential for becoming an NRA Certified Chief Range Safety Officer, which will allow you to teach your own NRA Range Safety Officer classes. There are two ways to achieve this goal. The first option is to become an NRA Certified Instructor then take the NRA Certified Chief Safety Officer course. The other option is to become an NRA Certified Instructor, teach for two years, then become appointed as an NRA Training Counselor.